 What this new rider did to prepare for his first big trip makes perfect sense. Steve Green of Southern California wanted to visit Alaska ever since he first read about the building of the Alaska Highway as a child. He had been thinking about the idea of taking a motorcycle trip to Alaska, but he hadn’t ridden motorcycles in 28 years. His true inspiration came when his wife told him, “You should go, you don’t know how long you’ll still be able to ride a motorcycle.” That’s when he made the decision to pursue his dream and start preparing for an epic adventure tour to Alaska. After such a long break from riding, Steve took a common sense approach to re-entering the sport. He knew his dream of viewing soaring eagles and calving glaciers could not be achieved without adequate preparation. He would need to learn how to ride again and develop the skills required to handle a big bike off-road. He would also have to identify and acquire the right gear, supplies and tools to complete the trip. It’s all too common to see newbie adventure riders embark on their first big trip totally unprepared. Their cavalier approach leads to problems that could have been easily avoided, creating extra stress during their trip. Steve took a more pragmatic approach, taking two years to get back into the sport before embarking on his big Alaska Adventure. It may have been overly cautious, but his practical trip planning approach provides valuable insights for any new Adventure Rider interested in embarking on an epic adventure tour. Below is a summary of what Steve did to prepare for his 10-week Alaska Tour. • Take a refresher motorcycle riding course. • Test ride several bikes before buying. • Practice off-road riding on smaller bikes. • Watch videos about off-road riding technique. • Talk to other experienced riders for advice. • Join several organized weekend group rides. • Practice fixing a flat before you leave. • Read regional tour planning resources and guides. • Read about what gear and supplies to bring. • Order fresh tires ahead of time for pickup. • Get a detailed map of the region. • Talk to dealer about maintenance, tools and spares. • Practice using all electronics before you depart. • Change oil before leaving to postpone maintenance. 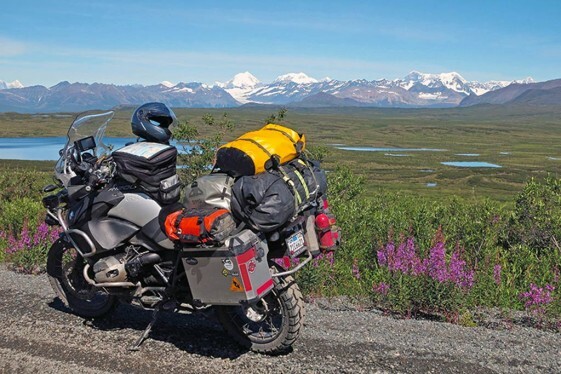 In his article “An Alaskan Motorcycle Adventure How-To,” Steve shares many more valuable tips about travelling to Alaska. He discusses how to save money, increasing safety and insights he learned during the trip. You can also check out this video he created about his journey. I watched your video and really enjoyed what a great production you did. Simple and clear instead of fancy. Inspires others to do one that is that easy to watch and enjoy. Thanks. I am so happy that another human being has fulfilled one of their dreams. I agree with Brad Gray’s comment about your video. I have sat here in my kitchen in the south of the England in the UK, watching your video on my laptop. Whilst I was in awe of the serine, yet magnificent scenery, your commentary being enjoyable too, mostly I was in awe of you for living your dream. It was great to see another, as it appears for you too, that throughout your journey you have to a certain degree had a lost faith in mankind re-endorsed. Your voice at times and photo’s depict and emphasised this to me… No doubt your journey will have engulfed you with many feelings, I hope for you most of all, that peace, happiness and a certain contentment has been found inside yourself. For 20 years I worked as a M/C courier. After 5 years in the business I decided to branch off on my own and became a long distance M/C courier. Subcontracting to major companies, my work meant driving the roads of the UK and Europe too. Long days, sometimes through the night were spent alone with only my trusty steed for a best friend, often on unknown roads we faced many challenges together as we travelled up to a 1000 miles each day in all weather conditions. Like you, I also met many good folks along the way and shared in the things you experienced on your journey. So I can understand what your mind now must feel like… I hope you can reflect for the rest of your days with many smiles and a proud sense of achievement. Perhaps for you too. your journey has helped to re-endorse a faith in mankind. I hope you go on to have many more journeys and adventures, if you have not already done so. With much respect and admiration for you my brother adventurer, I say ride safe and God speed. Best wishes to you Steve.